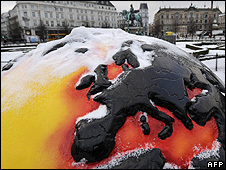 BBC News - Why did Copenhagen fail to deliver a climate deal? About 45,000 travelled to the UN climate summit in Copenhagen - the vast majority convinced of the need for a new global agreement on climate change. So why did the summit end without one, just an acknowledgement of a deal struck by five nations, led by the US. And why did delegates leave the Danish capital without agreement that something significantly stronger should emerge next year? Our environment correspondent Richard Black looks at eight reasons that might have played a part. Until the end of this summit, it appeared that all governments wanted to keep the keys to combating climate change within the UN climate convention. Implicit in the convention, though, is the idea that governments take account of each others' positions and actually negotiate. That happened at the Kyoto summit. Developed nations arrived arguing for a wide range of desired outcomes; during negotiations, positions converged, and a negotiated deal was done. In Copenhagen, everyone talked; but no-one really listened. The end of the meeting saw leaders of the US and the BASIC group of countries (Brazil, South Africa, India and China) hammering out a last-minute deal in a back room as though the nine months of talks leading up to this summit, and the Bali Action Plan to which they had all committed two years previously, did not exist. Over the last few years, statements on climate change have been made in other bodies such as the G8, Major Economies Forum (MEF) and Asia-Pacific Economic Co-operation forum (APEC), which do not have formal negotiations, and where outcomes are not legally binding. It appears now that this is the arrangement preferred by the big countries (meaning the US and the BASIC group). Language in the "Copenhagen Accord" could have been taken from - indeed, some passages were reportedly taken from, via the mechanism of copying and pasting - G8 and MEF declarations. The logical conclusion is that this is the arrangement that the big players now prefer - an informal setting, where each country says what it is prepared to do - where nothing is negotiated and nothing is legally binding. Just about every other country involved in the UN talks has a single chain of command; when the president or prime minister speaks, he or she is able to make commitments for the entire government. Not so the US. The president is not able to pledge anything that Congress will not support, and his inability to step up the US offer in Copenhagen was probably the single biggest impediment to other parties improving theirs. Viewed internationally, the US effectively has two governments, each with power of veto over the other. Doubtless the founding fathers had their reasons. But it makes the US a nation apart in these processes, often unable to state what its position is or to move that position - a nightmare for other countries' negotiators. Although the Bali Action Plan was drawn up two years ago, it is only one year since Barack Obama entered the White House and initiated attempts to curb US carbon emissions. He is also attempting major healthcare reforms; and both measures are proving highly difficult. If the Copenhagen summit had come a year later, perhaps Mr Obama would have been able to speak from firmer ground, and perhaps offer some indication of further action down the line - indications that might have induced other countries to step up their own offers. As it is, he was in a position to offer nothing - and other countries responded in kind. In many ways, Denmark was an excellent summit host. Copenhagen was a friendly and capable city, transport links worked, Bella Center food outlets remained open through the long negotiating nights. But the government of Lars Lokke Rasmussen got things badly, badly wrong. Even before the summit began, his office put forward a draft political declaration to a select group of "important countries" - thereby annoying every country not on the list, including most of the ones that feel seriously threatened by climate impacts. The chief Danish negotiator Thomas Becker was sacked just weeks before the summit amid tales of a huge rift between Mr Rasmussen's office and the climate department of minister Connie Hedegaard. This destroyed the atmosphere of trust that developing country negotiators had established with Mr Becker. Procedurally, the summit was a farce, with the Danes trying to hurry things along so that a conclusion could be reached, bringing protest after protest from some of the developing countries that had presumed everything on the table would be properly negotiated. Suspensions of sessions became routine. Despite the roasting they had received over the first "Danish text", repeatedly the hosts said they were preparing new documents - which should have been the job of the independent chairs of the various negotiating strands. China's chief negotiator was barred by security for the first three days of the meeting - a serious issue that should have been sorted out after day one. This was said to have left the Chinese delegation in high dudgeon. 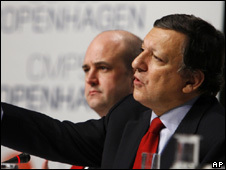 When Mr Rasmussen took over for the high-level talks, it became quickly evident that he understood neither the climate convention itself nor the politics of the issue. 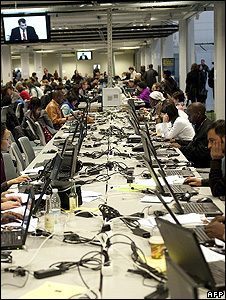 Experienced observers said they had rarely seen a UN summit more ineptly chaired. It is hard to escape the conclusion that the prime minister's office envisaged the summit as an opportunity to cover Denmark and Mr Rasmussen in glory - a "made in Denmark" pact that would solve climate change. Most of us, I suspect, will remember the city and people of Copenhagen with some affection. But it is likely that history will judge that the government's political handling of the summit covered the prime minister in something markedly less fragrant than glory. Although "climate sceptical" issues made hardly a stir in the plenary sessions, any delegate wavering as to the scientific credibility of the "climate threat" would hardly have been convinced by the freezing weather and - on the last few days - the snow that blanketed routes from city centre to Bella Center. Reporting that the "noughties" had been the warmest decade since instrumental records began, the World Meteorological Organization (WMO) noted "except in parts of North America". If the US public had experienced the searing heat and prolonged droughts and seriously perturbed rainfall patterns seen in other corners of the globe, would they have pressed their senators harder on climate action over the past few years? The way this deal was concocted and announced was perhaps the logical conclusion of a news culture wherein it is more important to beam a speaking president live into peoples' homes from the other side of the world than it is to evaluate what has happened and give a balanced account. The Obama White House mounted a surgical strike of astounding effectiveness (and astounding cynicism) that saw the president announcing a deal live on TV before anyone - even most of the governments involved in the talks - knew a deal had been done. The news went first to the White House lobby journalists travelling with the president. With due respect, they are not as well equipped to ask critical questions as the environment specialists who had spent the previous two weeks at the Bella Center. After the event, of course, journalists pored over the details. But the agenda had already been set; by the time those articles emerged, anyone who was not particularly interested in the issue would have come to believe that a deal on climate change had been done, with the US providing leadership to the global community. 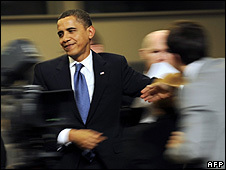 The 24-hour live news culture did not make the Copenhagen Accord. But its existence offered the White House a way to keep the accord's chief architect away from all meaningful scrutiny while telling the world of his triumph. For about two hours on Friday night, the EU held the fate of the Obama-BASIC "accord" in its hands, as leaders who had been sideswiped by the afternoon's diplomatic coup d'etat struggled to make sense of what had happened and decide the appropriate response. The EU called the deal disappointing, so why did the 27-nation bloc accept it? If the EU had declined to endorse the deal at that point, a substantial number of developing countries would have followed suit, and the accord would now be simply an informal agreement between a handful of countries - symbolising the failure of the summit to agree anything close to the EU's minimum requirements, and putting some beef behind Europe's insistence that something significant must be achieved next time around. So why did the EU endorse such an emasculated document, given that several leaders beforehand had declared that no deal would be better than a weak deal? • The fact that important EU nations, in particular France and the UK, had invested significant political capital in preparing the ground for a deal - tying up a pact on finance with Ethiopia's President Meles Zenawi, and mounting a major diplomatic push on Thursday when it appeared things might unravel. Having prepared the bed for US and Chinese leaders and having hoped to share it with them as equal partners, acquiescing to an outcome that it did not want announced in a manner that gave it no respect arguably leaves the EU cast in a role rather less dignified that it might have imagined. An incredible amount of messaging and consultation went on behind the scenes in the run-up to this meeting, as vast numbers of campaign groups from all over the planet strived to co-ordinate their "messaging" in order to maximise the chances of achieving their desired outcome. 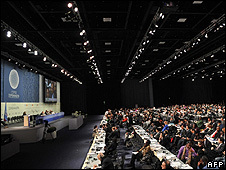 The messaging had been - in its broadest terms - to praise China, India, Brazil and the other major developing countries that pledged to constrain the growth in their emissions; to go easy on Barack Obama; and to lambast the countries (Canada, Russia, the EU) that campaigners felt could and should do more. Now, post-mortems are being held, and all those positions are up for review. US groups are still giving Mr Obama more brickbats than bouquets, for fear of wrecking Congressional legislation - but a change of stance is possible. Having seen the deal emerge that the real leaders of China, India and the other large developing countries evidently wanted, how will those countries now be treated? How do you campaign in China - or in Saudi Arabia, another influential country that emerged with a favourable outcome? The situation is especially demanding for those organisations that have traditionally supported the developing world on a range of issues against what they see as the west's damaging dominance. After Copenhagen, there is no "developing world" - there are several. Responding to this new world order is a challenge for campaign groups, as it will be for politicians in the old centres of world power. Western leaders don't have any mandate from voters for implementing the radical policies required to limit atmospheric C02. And the Chinese leadership won't implement any measures that might ferment popular opposition. So how could this conference have ever "succeeded"? The Copenhagen summit on climate change failed for only a simple reason: the lack of political will to understand, recognise and accept the scientific evidence and the worldwide daily havoc that is testimony of the reality of climate change. It failed to deliver because tackling climate change is contrary to the infinite economic growth theory that underpins capitalist economics and western consumerism. However, as we live on a finite planet, something will have to give. Copenhagen failed to deliver a deal because humans have forgotten humanity. I would add the following reasons: 1 Climate control enthusiasts "avant la lettre" are inclined to overstate their own opinion as being the right one. 2 The motivation from many countries' governments to participate in climate control talks is money. 3 Congresses do not make decisions. 4 Many individual parties had made statements to the public in advance what kind of deal should be realised, and therefore they were imprisoned by their own premature positions. The very premise that the conference is based on is faulty. Man-made global warming driven by CO2 is bunk. The more political an issue gets, the more perverted it gets. Climate change is a political hoax and scientific fraud. The whole thing stinks, any binding agreements on cuts in CO2 emissions would only have led to oppression and misery. Mr Black makes very insightful observations on eight points. But he has overlooked a ninth point, one which was completely and inexplicably overlooked at Copenhagen. If the participants had invoked the spectre of Peak Oil, the delegates would have had a second imperative to action. The peaking of global oil production, declining export capacity, declining net energy and the lack of viable substitutes for petroleum - these four issues are additional reasons why we need urgent and cooperative action to begin the transition.